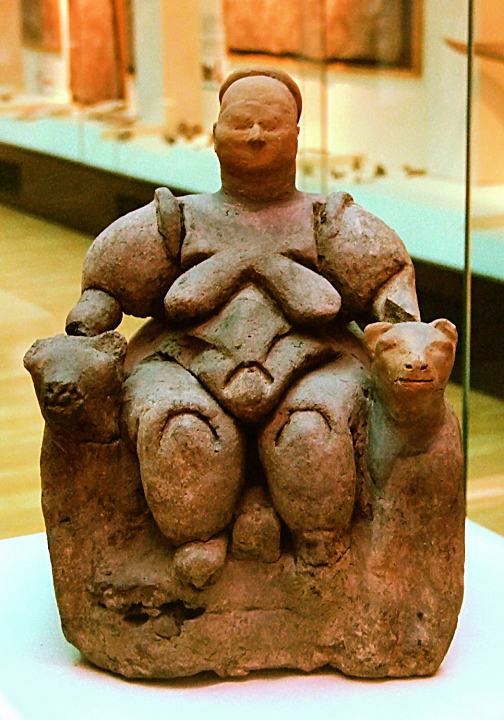 Yesterday I was doing a little research on a female figurine from Çatal Höyük. This figurine (shown right), dates from the 7th century BC. It was excavated in the 1960s by James Mellaart, who argued that this figurine (and the other female figurines found on the complex) are proof that a matriarchal society and goddess cult existed at Çatal Höyük. However, today archaeologists are questioning Mellaart’s goddess argument. Michael Balter points out that Mellaart developed his goddess theory in the 1960s, just when feminist movements were beginning across the world. I think it’s likely that Mellaart was influenced by his own cultural surroundings (and perhaps a desire to capture the interest of the general public?) when he came to conclusions about a Neolithic goddess cult and matriarchal society. There are other reasons why scholars doubt Mellaart’s conclusions. One of the main reasons is that there is actually very little evidence of a goddess cult. 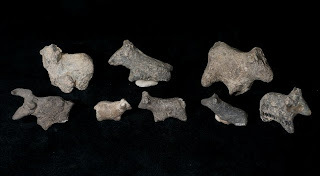 Along these lines, relatively recent excavations have found close to 2,000 figurines at Çatal Höyük, and most of them are not female figurines. Actually, as reported here, less than 5% of the figurines could be considered female. Most of the figurines are representations of sheep and goats. I think that this is a really interesting and fun theory, although I have some doubts. Just like Mellaart’s theory might have been influenced by the onset of the feminist movement, couldn’t this toy theory also be influenced by our 21st century mindset? 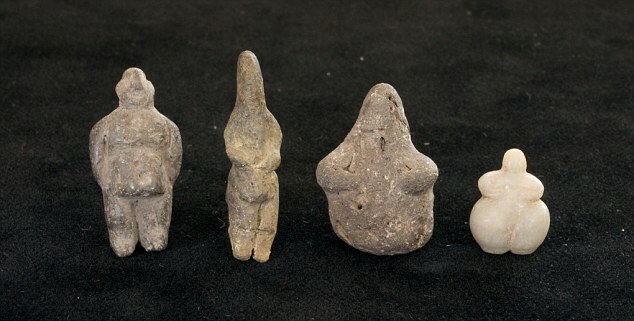 Just because children play with action figurines today (and because we throw toys away when they are broken or abandoned), how do we know that Neolithic people acted the same way? The competition to create a set of doors for the baptistery helped revive a project that had been put-aside for several years. When Andrea Pisano had created a set of doors about seventy years before (dated 1330), it was intended at the time that doors would be completed in a similar fashion for the remaining two portals. It’s easy to look at the competition submissions and see that the north doors resulted from that historic competition. But you need to be able to see the north doors in order to make that association. 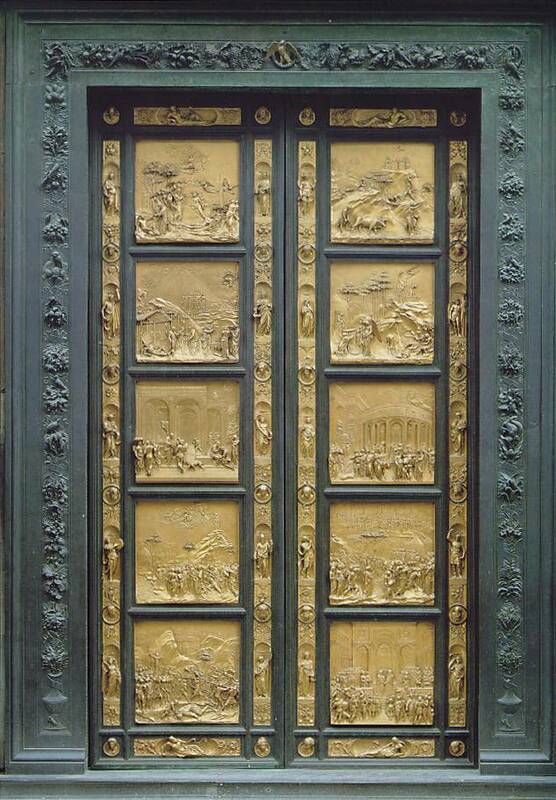 Many art history textbooks include images of Ghiberti’s and Brunelleschi’s competition panels (see this example in the most recent version of Gardner’s Art Through the Ages), but then don’t include pictures of the north doors. Instead, “The Gates of Paradise” is shown. It’s too confusing to discuss the 1401 competition and then display doors that weren’t directly associated with the competition! If textbook writers could include just an image of the north doors (even a small one), it could help students keep their facts (and doors!) straight. *7/25: I made a couple of revisions to this post, having found more information about the original location of Andrea Pisano’s doors and the nature of the 1401-02 competition. 1 See Laurie Schneider Adams, Italian Renaissance Art, (Boulder, Colorado: Westview Press, 2001), 60. In truth, at this time the Florence baptistery needed two portals to be decorated. The aim of the 1401-02 competition was to begin work on this project. For a little bit more information regarding the nature of the competition, see Manfred Wundram and Gustina Scaglia, “Ghiberti.” In Grove Art Online. Oxford Art Online, http://www.oxfordartonline.com/subscriber/article/grove/art/T031929pg1 (accessed 26 July 2010). 2 Ibid. Today Pisano’s doors are located on the south side of the baptistery. 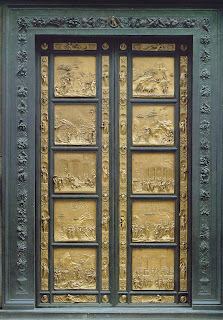 Manfred Wundram and Gustina Scaglia write that Pisano’s doors were originally moved to the west portal, in order to create room for the doors from Ghiberti’s first commission. 3 The now-northern doors were moved from the east side in 1452, soon after “The Gates of Paradise” were finished. And now, just as of this month, there are two more possible discoveries to include in the list. The Vatican recently reported the possible discovery of a new Caravaggio painting, the Martyrdom of St. Lawrence (see right). I have to admit, I’m quite skeptical about this new “discovery.” Although I haven’t seen the painting in person, some of the things look a little “off” to me. I think the treatment of the blue drapery is a little unrefined, as well as the rendering of Lawrence’s left arm and right hand. But who knows? I could be wrong. I’m a historian, not a connoisseur. Maybe I’m just skeptical as to why the Vatican is announcing this timely “discovery” during the celebrations marking the 400th anniversary of Caravaggio’s death. It seems a little too convenient, and I wonder if people are getting too hyped-up over Caravaggio to think sensibly. The other work of art recently “discovered” was found in the basement of Yale University Art Gallery (see left). 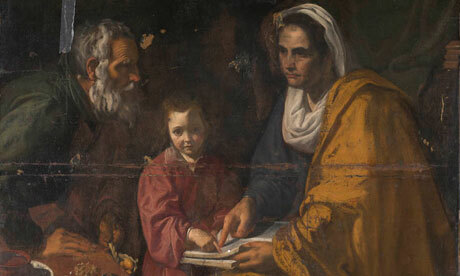 The Guardian reports that this battered canvas, which was located in the museum basement, has now been attributed to Velasquez. The Prado Museum is reserving judgment on the painting, and I’m tending to do the same. When I read that this painting was discovered in the museum basement, I sarcastically thought, “Of course. Of course it was discovered in the basement.” Maybe I’m too skeptical, but it seems like all museum directors would be interested in rummaging through their basement storage right now, ever since a possible Raphael was discovered in storage this past May. 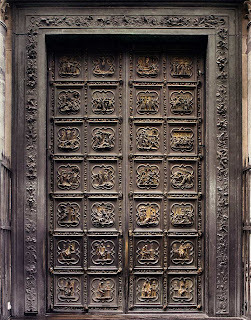 I bet I’m the only person who woke up early this morning and began thinking about the doors of the Hildesheim Cathedral. Oh man, I’m such a nerd! I have been thinking about these doors because of an interesting article that I read over the weekend (which I’ll probably explain in another post, but I wanted to jot down a couple of my own thoughts first). 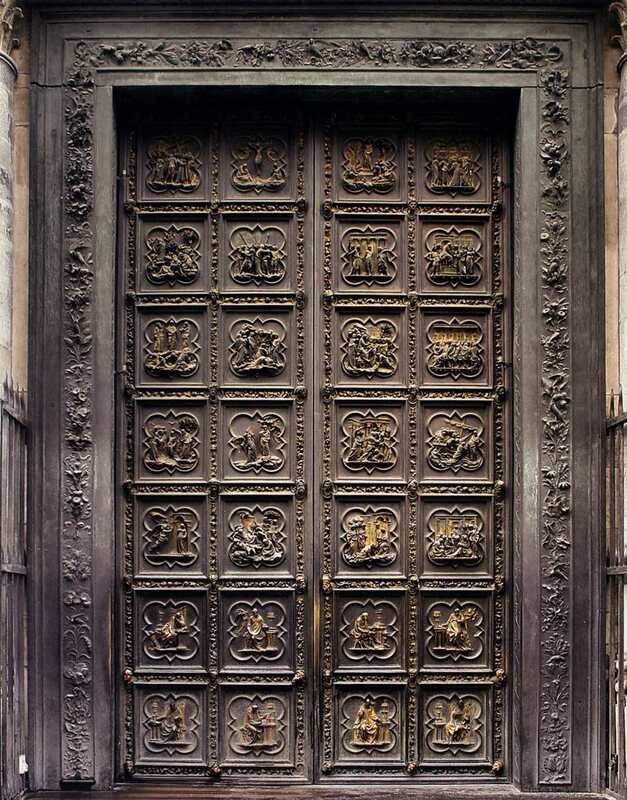 The doors of the Hildesheim Cathedral (also called the “Bernward Doors,”) date from 1015 (see a detail of the doors on the left, and click here to see a complete image of the doors). The left section of the doors includes scenes from the Old Testament, and the right section of the door includes scenes from the New Testament. The Old Testament scenes appear chronologically from top-to-bottom, whereas the New Testament scenes appear chronologically from bottom-to-top. I think this layout is especially interesting to consider in terms of how the viewer’s physical eyes and head would move when looking at the panels chronologically: the viewer starts by looking up at the Creation of Eve, and the viewer’s eyes and head would move downwards (to physically “fall”) as the story of The Fall is revealed. The composition of first Old Testament scene, the Creation of Eve, even encourages the viewer to look downwards – God the Father and Adam’s bodies are composed of downward pointing angles (click on the image above to look at the top panel in better detail). 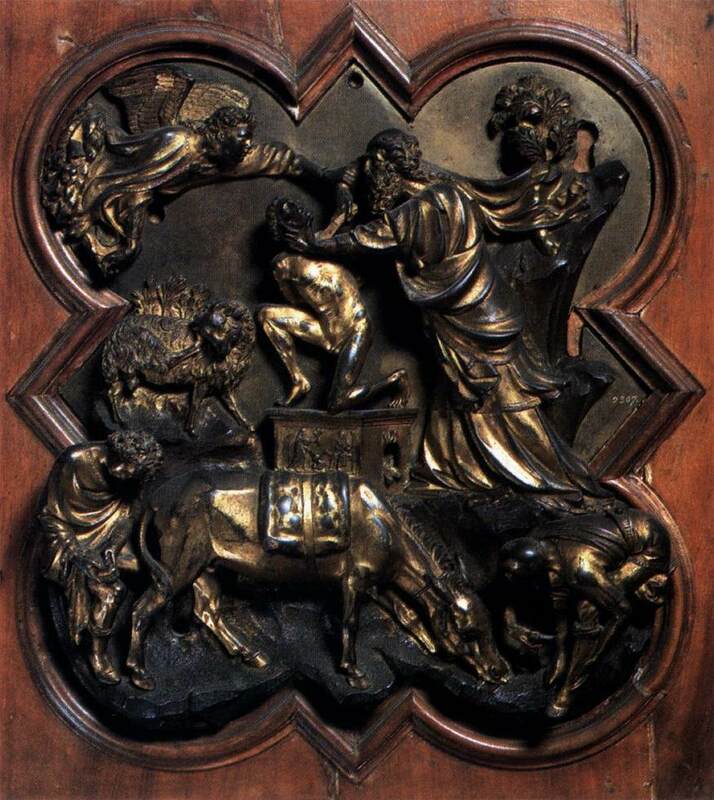 When reaching the end of the Old Testament section (the bottom of the left side of the door), the viewer moves his eyes over to the beginning of the New Testament section (the bottom of the right side of the door). The first New Testament scene shows the Annunciation. It’s interesting to note that the viewer’s eyes stay downwards at the beginning of the New Testament panels, particularly in terms of the redemption and the Fall (since Man is still in his fallen state before Christ’s birth and sacrifice). However, the viewer’s eyes and head move (or angle) upward as the narrative progresses, continually rising until Christ’s crucifixion and resurrection are completed. The last panel of the doors depict the Ascension of Christ into heaven. At this point, the viewer is again looking upward, in the same position that he/she assumed when first looking at the Creation of Eve. I think that the viewer is even encouraged to continue looking upward, towards heaven, in this Ascension scene. Christ’s body swoops and arcs upward, encouraging the viewer to literally look towards heavenly heights, beyond the physical boundaries of the door (see top panel in this image). I love when artists consider the physical participation of the viewer when creating a work of art. The Hildesheim viewer’s physical process of “falling” and “rising” with the biblical narrative is really cool. It’s almost like a medieval visitor to the cathedral could travel a mini-pilgrimage by just “moving” through these panels. 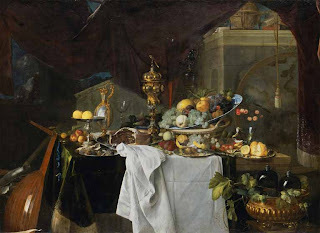 About a week ago, my brother-in-law asked if I knew of any 20th century still-life paintings which “quoted” or were influenced by a still-life from an earlier century. In essence, N was interested in seeing if any 20th century artists had abstracted a traditional still-life beyond recognition. I didn’t know of any direct copies/abstractions off the top of my head, but I did come across one example today (thanks to J!). Below is a painting by Matisse, which was influenced by the 17th century painting A Table of Dessert (“La Desserte”, 1640, shown on bottom). 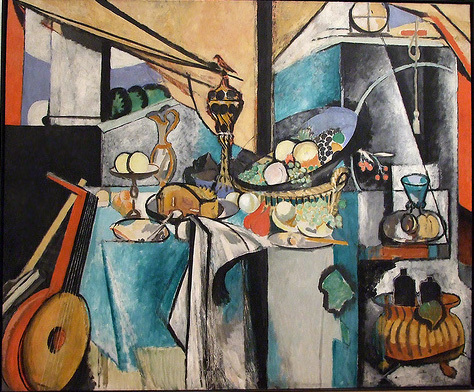 Matisse actually painted his version of this still-life after an academic copy that he made in 1893. I read a little about this painting in this article about a new Matisse exhibition at the MOMA. Looks like a fun show. Although this isn’t exactly what my brother-in-law was looking for (Matisse didn’t abstract de Heem’s still-life beyond recognition), it still is pretty fun. That being said – does anyone know of examples in which a 20th century painter abstracted an earlier work of art beyond recognition?